Our first yacht, which made our crewed yacht charter so popular from 2004 until 2009, is sailing yacht Alexandros which has the same layout as our new yacht Velos, is also fully air-conditioned but it is a bit smaller at 50 feet. 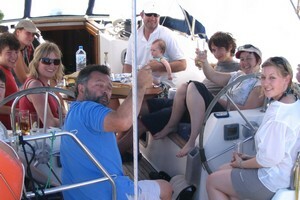 After we bought Velos we decided to keep Alexandros, partly for sentimental reasons and partly so that we could accommodate the occasional group that was more than 8 people (the group would split on both yachts). We had kept her in such an immaculate condition all these years and we performed so many upgrades, that it would be just a pity to give her away. 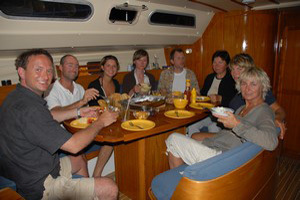 We had never thought however, that there would be so much interest in our crewed yacht charter, that from 2013 we would need to operate our second yacht full time from April to November, at the same cruising areas as Velos. This way we hope to keep everyone happy with their preferred dates, but also to offer the same holiday at more economical prices for those who would like something smaller and not as luxurious as Velos. Generally the differences between our two yachts are that Alexandros is a bit smaller than Velos and it's an older design (built in 1994 and refurbished in 2000, 2004, 2010 and 2014). As a cool environment is important for a good night's sleep, the yacht is fully air-conditioned and each cabin is also equipped with a fan. Alexandros operates in exactly the same way as Velos, having a permanent captain and hostess carefully selected and trained by us (Thanos and Alicia). 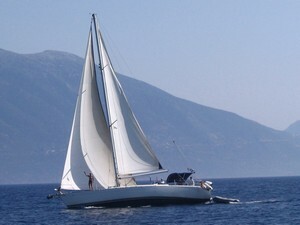 As usual on our Greek Island cruises everything is included in the price except for dinners. 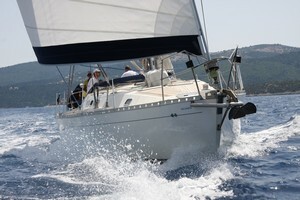 The type of rigging of the yacht is a sloop, which offers great performance under sail and ease of handling at the same time. 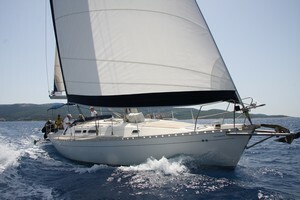 Both sails (genoa and mainsail) are furling automatically from the cockpit area, which makes it very easy to handle the yacht even single handed. With a total of 115 square meters of sail, Alexandros can offer some fast and exciting sailing and its 17 tons of displacement make it a very comfortable boat. We believe that one of the most important criteria for a yacht cruising around the Mediterranean Sea, is to have a large deck with plenty of room for sunbathing or just enjoying a drink during the evening, so this is a feature on both our yachts. All the deck surfaces around Alexandros are finished with teak, which doesn't just create a very nice appearance, but it is also very inviting to sit or sunbathe. As some of our guests are families with small kids, we have installed a strong guard rail all around, so they can wander around safely and participate in the sailing of the yacht. 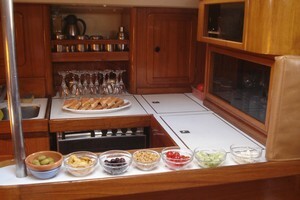 The cockpit is the heart of a boat in the pleasant climate of Greece, so it is designed to accommodate everyone (for a meal or a drink) and still remain practical for the sailing activities. 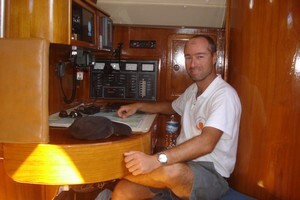 Similar to Velos and most of the bigger yachts, Alexandros has two steering wheels, which allow for a nice wide corridor through the cockpit, in the same time putting the helmsman in a better position to observe the sails. The swimming platform at the stern is equipped with steps extending under the surface for easy access in and out of the water and a shower so you can rinse yourself when you come out of the sea, or just cool down if you overheat while sunbathing. Below decks there is a large saloon, the navigation area, the galley and the cabins, all lying under the good insulation of the teak deck, spacious and comfortable. 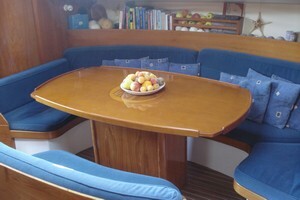 At the port (left) side of the saloon there is a big table with comfortable couches all around, where breakfast is served in buffet style. 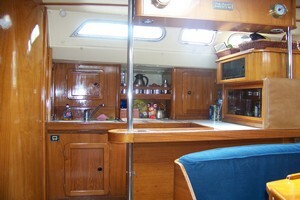 At the starboard (right) side of the saloon area is the galley, which is very functional with big surfaces to work, a large sink, gas cooker, two refrigerators and all the cooking utensils that could possibly be needed. It is placed in such a way that it doesn't obstruct anyone moving around the saloon area, but the guests can still take a glimpse of Alicia's famous lunches being prepared by their hostess. The navigation area is well equipped, with a GPS, VHF radio, Electronic Chart Plotter, EPIRB, wind speed - depth - boat speed meters, weather forecast receiver as well as all the charts and pilot books for Greek waters. On the recreation side of things, there is a Radio and CD player with speakers in the saloon and on deck. We have a small collection of music onboard, but you are welcome to bring your own. There are five air-conditioned cabins altogether. The four of them are situated around the saloon and the fifth which is the crew cabin, is at the bow with a separate entrance from the deck. They are all en suite with a marine electric toilet and a shower. They are also equiped with a fan. 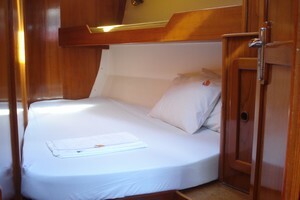 The two cabins that are at the front of the saloon have a double bunk as well as a single one above. The single bunk can be used in the case of two friends sharing a cabin and using different beds, or just as a shelf to store your clothes. The other two cabins at the rear of the saloon have a similar layout as to those at the front. 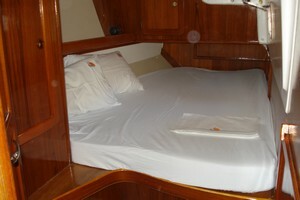 However, instead of the single bunk they have a wider double bed, which makes their bathroom slightly smaller. Access to all guest cabins is from the saloon. Until 2017 we accommodated up to 8 guests in the 4 cabins around the saloon, but from 2018 we decided to take a maximum of 6 guests, so that your stay will be more comfortable. The guest cabins are the two at the front of the saloon as well as the one at the rear of the saloon, while the second cabin at the rear of the saloon is used by the crew. Please note that the cabins and bathrooms on yachts less than 55 feet are not spacious as the ones you would find on cruise liners and ferries. In the warm climates most of your time during the day is spent up on deck anyway, sunbathing, relaxing, sailing or snorkelling in the sea, so the cabin is practically a comfortable place to sleep at night. The engine is a powerful Yanmar 110HP, used to take the yacht in and out of a harbor and take «Alexandros» to the destination when there is no wind. Finally, the electricity generator is a quiet Fischer Panda 10KW, capable to run all the air-conditioning units and top up the yacht's batteries. The diesel tank has a capacity of 400 liters which is enough to make long passages across the Med, just with the engine alone (if needed, as we prefer to sail!). Additionally, the water tanks have a capacity of 1000 liters which is more than enough for the needs of the boat, as they are toped up with fresh water every couple of days.